One for the boys! I tend to paint girlie things (even the new creepy girls are still *girls*), so I figured painting something a little more masculine would be a good exercise for my daily painting project. I’m really happy with the way it turned out and discovered an interesting side benefit of the daily paintings – it forces you to really examine every day objects. I played baseball (softball) for a few years when I was a kid and though I wasn’t very good (soccer was more my sport), I definitely grew up in a baseball house. My sisters were quite competitive. My dad played, then coached, then umpired. Even before I played I remember being in charge of my dad’s gear and was thrilled to get my very own uniform that said “Bat Girl” on the back. Awesome! 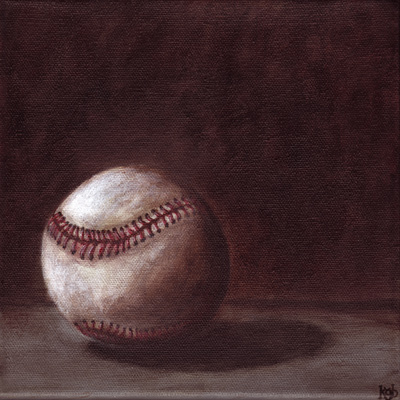 When I got down to painting the details of the baseball, I started to notice things in the stitching I’d never paid attention to before. The shadows each puncture hole makes are quite dramatic and the stitches are quite a bit more raised than I would’ve thought if I’d been painting just from memory. Small details, but it does have me wondering what else I’m missing, what else I tune out when my eyes are confronted with the everyday clutter. We shall see! I love the play of light and shadow across the baseball. Stunning!